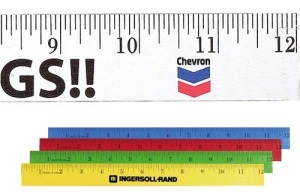 Civic clubs, volunteer organizations, and community service groups use wood 12-inch rulers as a thank you to help recruit volunteers, and imprint them with general reminders such as "Make it a Rule to Volunteer". Name identification can be increased by offering a useful item such as our wooden rulers. If people see your name on a repetitive basis, they soon learn your name and become familiar with it. After becoming familiar with your name, and you have the high recall in their mind, they become comfortable voting for you or doing business with you. People do not feel comfortable voting for a stranger. Increasing your Name Identification -- the most important purpose of a political advertising campaign. Custom printed wooden rulers, a product they will want to keep, and your name will be deeply impressed in their mind for many occasions to come.